One of the main reasons I fell in love with Marvel in the first place? Alternate dystopian universes where a major villain has ascended to ruler of Earth. And by that, I of course mean Age of Apocalypse is awesome. AoA set the bar in the 90’s as a universe-spanning crossover where nothing was sacred. Apocalypse was ruler of Earth with a small resistance of familiar heroes hanging on for dear life. Suddenly, not even the most familiar of Marvel heroes were guaranteed to win, or survive the catastrophic new reality. Age of Ultron takes its cues from Apocalypse in both title and delivery. From the very first issue it’s clear the Marvel Universe is in the thralls of the genocidal artificial intelligence known as Ultron. The heroes we know and love have two choices: submit or perish. The scales seem to tilt in favor of perish. 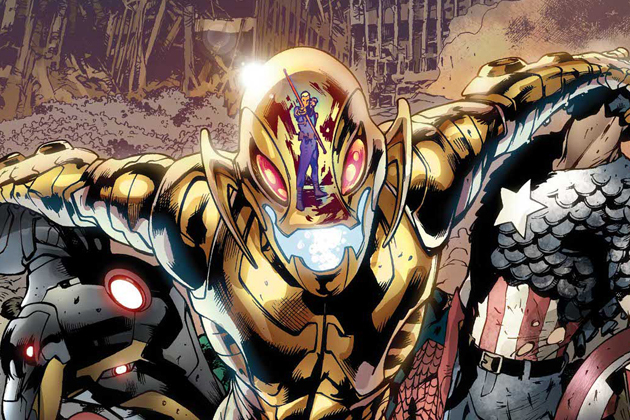 Below you’ll find the complete reading order list for the issues in Age of Ultron. For the most part, Marvel kept this event streamlined, without the usual bulk of series tie-ins that go into expanding the event. In some ways this limits the scope of this new Ultron era, but for the most part it makes for a cleaner reading experience that’s easy enough to enjoy. If you want more on the history of Ultron before diving into this event, you can check out my Ultron overview here. Unfortunately, Age of Ultron doesn’t have a mega hardcover with the entire reading order included. That said, this trade collection will get you Avengers #12.1 (a bit of prologue) and Age of Ultron #1 to #10. Seeing as Age of Ultron isn’t overly tie-in heavy, this actually works pretty well for the event. This Point One issue of Avengers acts as an off-hand Age of Ultron prologue, well before the actual events of AU. This Fantastic Four tie-in occurs chronologically before Age of Ultron #1. Personally I prefer to read it as it was published after the first two AU issues, with the universe of Ultron already established, but if you want to follow a more linear timeline, bump it before AU #1. Superior Spider-Man causes some unique continuity problems. For starters, you’ll definitely want to be caught up on the first few issues of Superior Spider-Man or find yourself smacked in the childhood with major spoilers. Second, Bendis’s Age of Ultron issues seem to ignore the major change within Superior, making for a mildly confusing debate on the state of Spidey in AU. Most importantly – the big reveal at the end of Age of Ultron #3 is actually teased for eagle-eyed readers in Superior. There’s an argument to be made to read Age of Ultron #3 first to save this surprise, but chronologically this book is before AU #3. Chronology of this issue is very open. Largely standalone events, so you can really fit in at any point in the first six or so issues. Here works just fine, as published. The Marvel Now reading order also includes Ultron comics, the same comics on this reading order? When coming across Ultron story arc, which one should I follow? They seem very similar. That one just lists the comics to read but this one tells you the order so you should follow this one. Probably worth a mention that the prologue issue Avengers #12.1 is from the pre-Marvel-NOW! Avengers series (“Avengers (2010 – 2012)” on MU), not the Marvel NOW! series “Avengers (2012 – Present)”, in case anyone is having trouble finding it. I noticed that some of the issues in this list were already mentioned in the Marvel NOW! reading order, so should I read those tie-ins before the event or here? Is this the last guide? Nope, check out the complete guide for everything. Epilogue to the event that I’ve now added above. Good call! I absolutely love the Age of Ultron comic book series. Now that the movie is out… i’m super super excited. Anyways, I just wanted to share this comic book site with you guys. I usually go here to read free comic books of sorts. Thanks for the feedback, guide has been updated! Hey, Dave! I just bought a bundle for Age of Ultron. It includes everything in your reading guide except the final one, Avengers AI #1. I can’t find any reference to it at all – might it be a typo? Hey – Avengers A.I. ran for 12 issues, and that first issue launches out of Age of Ultron. Hope that helps! It’s Wolverine & X-Men #27AU, not 26AU. I was having trouble making heads or tails of the proper order on Marvel Unlimited until I found your page; so THANK YOU! This is much more thorough and complete than the Wikipedia article. Perhaps you would consider adding your content?